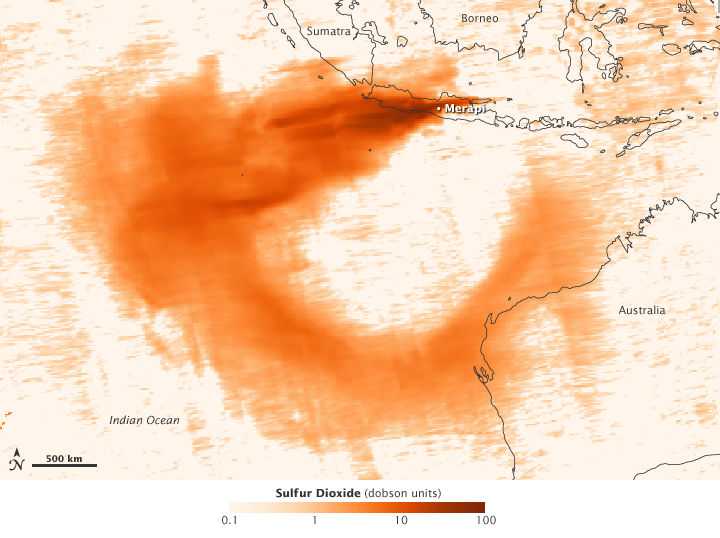 Image shows concentrations of sulfur dioxide release by Mt Merapi volcano between November 4 and 8, 2010. The image was processed from data acquired by the Ozone Monitoring Instrument (OMI) on NASA’s Aura spacecraft. “Sulfur dioxide is measured here in Dobson Units: The greatest concentrations appear in dark red-brown; the lowest in light peach. Typically used to measure ozone, the Dobson Unit is the number of molecules of gas that would be required to create a layer 0.01 millimeters thick at a temperature of 0 degrees Celsius and a pressure of 1 atmosphere (the air pressure at the surface of the Earth).” Source: NASA E-O. This entry was posted on November 11, 2010 at 2:06 pm	and is filed under aerosols, Merapi Eruption, Mount Merapi volcano, sulfur dioxide, volcanoes. Tagged: Indonesia volcanoes, Merapi Eruption, Mount Pinatubo, pyroclastic flows, singapore sling. You can follow any responses to this entry through the RSS 2.0 feed. You can leave a response, or trackback from your own site.